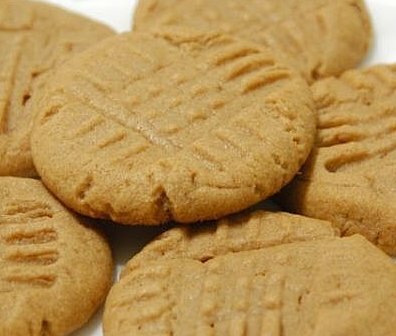 Peanut Butter Cookies are another favorite recipe of mine. A recipe collection would not be complete without most children’s favorite cookie. This recipe for Peanut Butter Cookies will melt in your mouth. The edges are chewy, the centers are soft, and the tops are crinkly. This is a very easy-to-make and delicious cookie. I believe this class Peanut Butter Cookie recipe was originally a Betty Crocker cookbook recipe from the 1950s. History: George Washington Carver (1864-1943), an African-American educator, botanist and scientist from Alabama’s Tuskegee Institute, began to promote the peanut as a replacement for the cotton crop which had been destroyed by the boil weevil. By 1903, he developed hundreds of uses for peanuts in recipes. In his 1916 Research Bulletin called How to Grow the Peanut and 105 Ways of Preparing it for Human Consumption, he has a three recipes for peanut cookies calling for crushed/chopped peanuts as an ingredient. In 1922, Joseph L. Rosefield began selling a number of brands of peanut butter in California. These peanut butters were churned like butter so they were smoother than the gritty peanut butters of the day. He soon received the first patent for a shelf-stable peanut butter which would stay fresh for up to a year because the oil didn’t separate from the peanut butter. One of the first companies to adopt this new process was Swift & Company for its E.K. Pond peanut butter – renamed Peter Pan in 1928. In 1932, Rosefield had a dispute with Peter Pan and began producing peanut butter under the Skippy label the following year. Rosefield created the first crunchy style peanut butter two years later by adding chopped peanuts into creamy peanut butter at the end of the manufacturing process. It is not until the early 1930s that peanut butter was listed as an ingredient in cookies. The 1933 edition of Pillsbury’s Balanced Recipes by Mary Ellis Ames, Director of the Pillsbury Cooking Service, contains a recipe for Peanut Butter Balls. It instructs the cook to roll the dough into balls and press them down with the tines of a fork. This practice is still common in America today. * Do not use old-fashioned style peanut butter or freshly-ground peanuts. Preheat oven to 375 degrees F. Lightly grease cookie sheets or use the Silicone Baking Mats to prevent the cookies from sticking. I personally recommend that you use the Silicone Baking Mats as nothing sticks to them. In a large bowl, cream butter or margarine, granulated sugar, brown sugar, and peanut butter until light and fluffy. Stir in egg, flour, baking powder, baking soda, and baking salt. Using your hands, roll dough by teaspoonfuls into approximately 1-inch small balls; place balls onto the prepared cookie sheets spaced about 2 inches apart. Flatten each ball into a crisscross pattern with a fork that has been dipped in water. To make a crisscross desigh, dip a dinner fork into a small bowl of cold water and then press the fork into the dough ball. Rotate the fork 90 degrees and press it into the dough ball a second time. Bake 10 to 12 minutes or until cookie edges are golden and centers have puffed and are beginning to deflate, approximately 10 to 12 minutes. Switching and rotating baking sheets half-way through bakinglight. NOTE: Do not over bake as the bottoms of the cookies will burn easily. Remove from oven and cool on wire cooling racks.